As chief selector, he saw his Pakistan side hold England to a 1-1 Test series draw, featuring a famous victory at Lord's. So how does Inzamam-ul-Haq think India will fare in their upcoming five-match series against Joe Root's side, and how will Virat Kohli put past disappointments in England behind him? 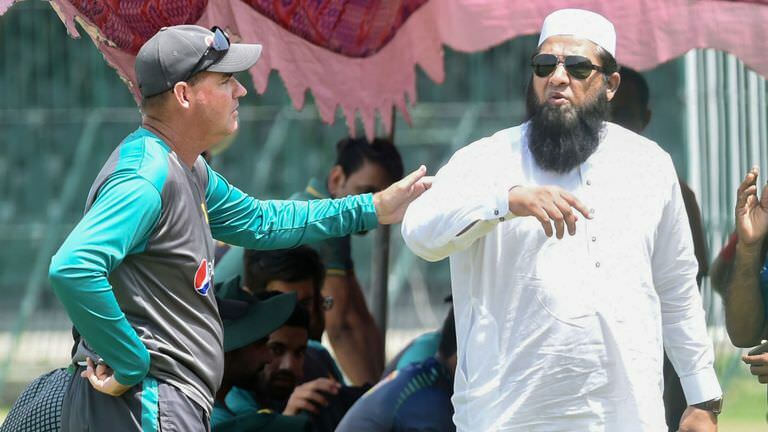 Saj (for Sky Sports) caught up with the Pakistan legend to find out more, as well as getting Inzamam's thoughts on the future of Pakistan cricket and the flak he received for picking his nephew, Imam-ul-Haq. PakPassion.net: How do you feel your tenure as Pakistan's Chief Selector has gone so far? Inzamam-ul-Haq: Thanks to The Almighty that during my tenure as Chief Selector, the Pakistan team has seen the introduction of new players and our performances have also started to improve. It's most satisfying to see the young players who are coming into the Pakistan side doing well and putting in lots of hard work and producing good performances. The balance of the team has also improved steadily and if given consistent chances, my hope is that these young players will become very successful in the future and serve Pakistan for a long period of time and provide many victories for us. One other aspect that I would like to highlight is that these young players are playing like a well-gelled unit and are doing well despite the fact that they are still new to international cricket and do not have the services of big-name players to help them along. PakPassion.net: What are your thoughts on the team's performance in the recent matches against Ireland, England and Scotland? Inzamam-ul-Haq: This was indeed a matter of happiness for us that we did so well in the Tests against Ireland and England and then won the T20I series against Scotland. We won 4 out of 5 of our international games on this tour which is an excellent achievement. I will not say anything to the people who criticized our selection but what they need to focus on is the fact that Pakistan have been so successful in away series with a team of new players which is a huge positive for us. PakPassion.net: What is your vision for the future of Pakistan cricket? Inzamam-ul-Haq: I understand that there are people who are highly critical of our selection policies saying that the teams should have certain players and so on, but what they need to realise is that the selectors, captain and coach have a certain vision and want to select teams that will not just give us success in the next series but ones that will serve us in the long term. The collective selection decisions which were made by Sarfaraz Ahmed, Mickey Arthur and the selectors were very tough for us but thankfully, the players we selected for the recent tour of Ireland, England and Scotland performed really well . One thing to note and this is something I strongly believe in is that some of the newer players were picked directly for their First-Class performances which will really encourage the players who are doing well at that level. What that will prove to aspiring First-Class players is that they too can be picked for the national team and also the fact, when given the chance, they are good enough to play international cricket and perform well at that level. All in all, I believe this sort of selection policy will greatly benefit Pakistan cricket. PakPassion.net: How tough is it to be Chief Selector in a country where every other person thinks they can do a better job than you? Inzamam-ul-Haq: In any country like Pakistan where cricket is followed so passionately and there is so much admiration and scrutiny of the players, it is logical that everyone will have strong opinions about national cricket. It does make the job of the selectors very tough as all their decisions are under the scrutiny of the whole nation. But what we, the selectors, strive to do is to perform our duties with sincerity and honesty to ensure that we make a team which helps Pakistan cricket in the long term. We cannot, obviously, take the opinions of the whole nation into account every time we select a squad but what is important is to understand that the philosophy behind the selectors and the PCB management’s thought process is to create a team which can serve us for the long term. Yes, we do get a lot of criticism for some of our decisions but hopefully, the detractors will get to see the results of our policies as the players we have selected will be seen to serve the nation well in the future. PakPassion.net: What thought process goes into a selection of the national squad? Inzamam-ul-Haq: As we know there are many players who score well in First-Class cricket and as a selector one needs to keep an eye on that aspect of the player’s performance. But, we also need to see how such a player will perform when introduced into international cricket. This is exactly where the selection committee’s expertise comes into play as we sit down and discuss the potential of these players before taking decisions. Thankfully, our way of working has turned out to be successful which is very pleasing. PakPassion.net: Despite objections, you were adamant for Rashid Khan’s selection when you were Afghanistan's Head Coach. You must be delighted with the progress he has made? Inzamam-ul-Haq: Rashid Khan is an excellent cricketer who has impressed us all with his performances in international cricket and has shown us what he can do by becoming the world's number one T20I bowler. Apart from being a very good bowler, he is also a good fielder, but we must not forget that he is a good batsman as well. I am hoping that given his skills, he will also put in some good batting performances in the future. When he first came on the scene, it appeared that he was just a regular leg-spinner but when I looked at him closely, I realised that he spun the ball at a good speed which would make it difficult for batsmen to read him and give them less time to react to his style of bowling. This is what made me very keen to pick him and think that he would be effective in international cricket and would be able to perform really well at the top-level. I am happy that he has proven himself to be an excellent player after being selected for international duties. PakPassion.net: You were a batsman who coped so well when the pressure was on. Do you think Azhar Ali and Asad Shafiq can perform now that they are expected to lead Pakistan's batting unit? Inzamam-ul-Haq: I believe that both Azhar and Asad should be able to stand up to the pressure of international cricket. Azhar has played 65 Tests whilst Asad has 61 Tests matches to his name so they are best placed to take the responsibility of helping the team move forward. Both Azhar and Asad performed well last year, although Azhar has had a few issues with his fitness recently, particularly with some problems with his knee. We should avoid saying that these players are unable to handle the pressure just because of below-par performances in one or two innings and I feel that both are capable and have the talent to handle the batting responsibility for Pakistan’s Test side without any problems. I am confident that in the future we will see that both of them will perform well and fulfil the responsibilities placed on them due to their seniority in the team. PakPassion.net: You have faced some criticism for selecting your nephew Imam-ul-Haq, how do you respond to those critics? Inzamam-ul-Haq: When it comes to the selection of any batsman, we take the advice of the Head Coach and the batting coaches as well. The batting coaches are aware of what work the player has done during the off-season and is a good indicator of his progress. In Imam’s case, we asked for a report from the Pakistan batting coach, Grant Flower and he praised Imam and recommended that he should be included in the side as he has the potential to become a good international player. Based on that, we gave Imam a chance to play in the Test side in Ireland and England. Now I am not saying that Imam’s performances during those games were exceptional or he does not have flaws, but what I see in him is the potential to become a better player, as long as he continues to work hard. Now, it depends on the player to avail the chances he gets. However, before judging any new player, let us recognise the fact that any player who makes an entry into international cricket is never the finished product, but his skills improve with time. Let me reiterate that my assessment as a Chief Selector is that he, like others, has the potential to become a better player who can serve Pakistan in the future. PakPassion.net: What's your assessment of Mickey Arthur's performance as Pakistan's Head Coach? Inzamam-ul-Haq: There is no doubt that Mickey has done wonders for the Pakistan side. He is the one who makes the plans for the team and handles the players on a day-to-day basis. The Head Coach has a huge role to play in any team and credit must be given to Mickey for the excellent performances that the Pakistan side has displayed since he took over the role. The team has also shown unity under his tenure and the fitness levels of the players is much better than before. Whilst Mickey and his staff need to be congratulated for their hard-work, we should also give credit to captain Sarfaraz Ahmed as he has also played an important role in the selection and management of his side. PakPassion.net: What improvements does Babar Azam need to make to become a world-class batsman? Inzamam-ul-Haq: There is no doubt in my mind that Babar has a lot of talent and potential. There aren’t that many players in world cricket who can play so well in all 3 formats of the game. He is outstanding in T20Is where he is the number one ranked batsman and is in the number 5 position in the ODI rankings. It's only in Test cricket where his performances need improvement but as he showed on the recent tour of Ireland and England, there has been considerable improvement in this aspect of his cricket as well. His partnership with Imam-ul-Haq during the one-off Test against Ireland was a crucial one and helped Pakistan secure victory and then in the first Test match against England at Lord’s he scored 68 before he had to leave the field due to an injury. So, we can see that he has shown great improvements in Test cricket as well. He is one of the main players of our team and day-by-day, he is learning and improving. I feel that he has the potential to become a world-class player and also break many records along the way. PakPassion.net: What are your thoughts on Joe Root as a batsman? Inzamam-ul-Haq: He is a great player and the most important aspect of his batting is that he has scored well not only at home but also abroad. To me, the mark of a great player is that he is able to perform well in all conditions and this is what Root has shown to everyone with outstanding performances around the world. He is still new to the job of England’s Test captain and as he gets more experience in this role, he will also prove his worth as a captain in the same way as he has shown in his batting. PakPassion.net: Virat Kohli has a poor record in England but do you think he can inspire his side to victory in the upcoming series against England? Inzamam-ul-Haq: There is no doubt in my mind that Virat Kohli is a great player and his performances are proof of this fact. Just because he has not been able to score heavily in England does not undermine his stature as an all-time great batsman. If he is not able to put in a good performance in one or two innings then that does not in any way reduce his stature as a player. We know that he works hard and he continues to learn day-by-day and we saw that proof in the manner he played in South Africa where he helped his side lift their game. Despite the fact that he may not have a good past record there, England need to be wary that a player of Virat Kohli’s quality can easily help his side win the upcoming series between the two sides.